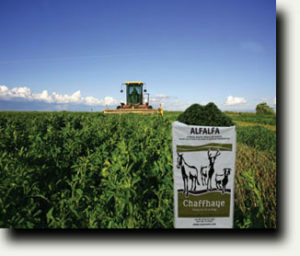 Chaffhaye Alfalfa Pasture In A Bag is now available at select Farmers Coop locations. Chaffhaye is premium bagged, Non-GMO Alfalfa sold in 50-pound bags that captures the key characteristics of fresh pasture, while also offering a guaranteed level of nutrition. It is ideal for ensuring maximum health and well-being of all classes of horse, deer, goat, llama, chickens, camelid, and other exotic animals. No “Haybelly” – Less intestinal fill means a better fitting saddle and a better performing athlete. Enhanced Digestibility – Chaffhaye maintains proper gut pH and allows the animal to better extract energy and nutrition from forage. Consistent Nutrition – Guaranteed Chaffhaye nutrition for 16 months from the date of manufacture. Dust Free (Naturally Moist Feed) – Chaffhaye minimizes respiratory ailments in animals sensitive to dust or airborne mold spores. Natural Probiotics – The fermentation enriches Chaffhaye with yeast, enzymes and beneficial microflora that aid digestion. No Barn Required – Chaffhaye is compressed inside a weatherproof bag that allows for storage inside or out. Premium Quality – All alfalfa grown on Non-GMO verified farms. Zero Waste – Moist & palatable, animals normally eat 100% of Chaffhaye. No stems left behind. Pick up Chaffhaye Alfalfa at Farmers Coop locations in Poteau, Oklahoma, Van Buren, Mena, Ozark, Elkins, Springdale, Lincoln, and Fayetteville, Arkansas. This entry was posted on Thursday, February 7th, 2019 at 10:29 pm	and is filed under Cattle, Goat, Horse, News & Updates. You can follow any responses to this entry through the RSS 2.0 feed. Both comments and pings are currently closed.